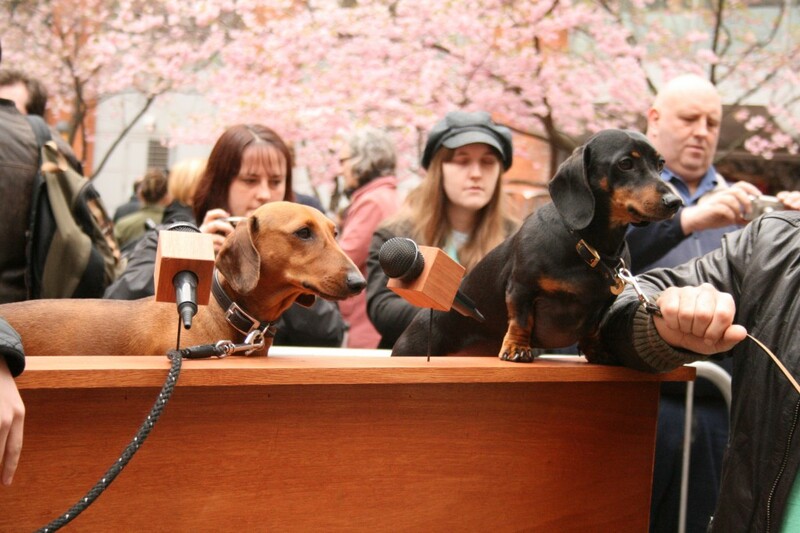 It would appear that nobody ever told Bennett Miller, whose installation Dachshund U.N. drew a huge crowd outside the IKON gallery yesterday, never to work with children or animals. And it’s a good job they didn’t – Bennett’s installation is exciting, provocative and very, very funny . The set is a model assembly with tiered seating, which took MIller’s father six months to build – with dachshunds representing the member nations. Their owners stand watchfully beneath, earnestly trying to control their pets and maintain healthy international relations. This unpredictability adds to the humour of the work and ensures that, as the piece goes on, the crowd grows and grows. At one point, people were standing on nearby restaurant tables and chairs to get a better view. And it’s not just the human audience who are enjoying themselves – there are packs of pet sausage dogs peering up at the structure and barking gleefully. “We came up from the Isle of White to get involved,” say Irene and Trevor, who brought their dachshunds Rudi and Obi over 150 miles to represent Ukraine and the Netherlands respectively. “It’s been great fun,” smiles Irene.